Kuala Lumpur is the capital of Malaysia with a population of some 1.6 million. Early Saturday, March 8, 2014, at 12:41 AM local time, Malaysian Airliner MH370 took off for a routine 2,700 mile flight to Beijing. But at 1:19 AM over the Gulf of Thailand, MH370 disappeared when the transponder shut off. 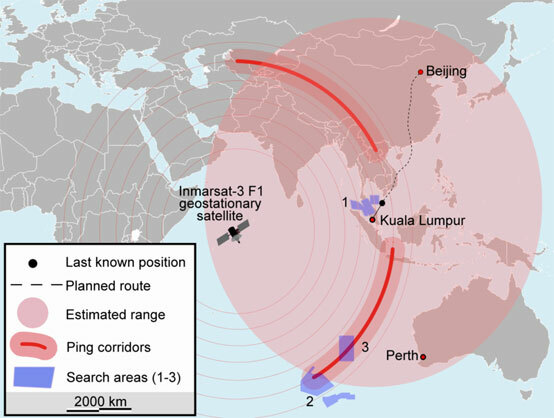 Inmarsat-3 F1 geostationary satellite picks up data that indicates that MH370 went either north or south along the red arcs. Possible black box pings were heard in the Indian Ocean southwest of Perth, Australia, where underwater drone searches as of April 23, 2014, had not found any wreckage. Map of search for MH370 by Soerfm, Wikipedia. Boeing 777-2H6ER 9M-MRO, the aircraft used for flight MH370. Credit: Rodger McCutcheon, Auckland Photo News. 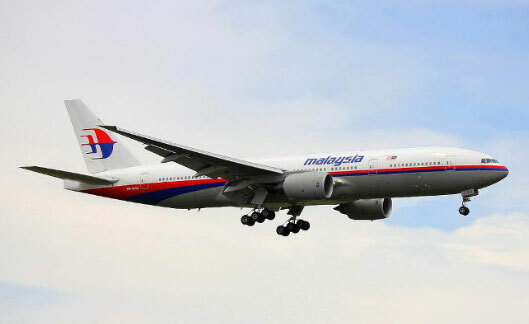 April 25, 2014 Albuquerque, New Mexico - MH370 Malaysian airline pilot Captain Zaharie Ahmad Shah, 53, on Friday, March 7, 2014, traveled from his Kuala Lumpur home 15 miles to Putrajaya to attend the trial of his friend, Malaysian opposition leader Anwar Ibrahim. Captain Shaw was enraged when Ibrahim was sentenced to five years in jail on a homosexuality charge. Next PostNext NSA Reply to FOIA Request On MH370: “Currently and properly classified matter.” What does NSA know?